There’s nothing more relaxing than a long hot shower. Without proper ventilation in your bathroom, the humid air will remain in the house and can eventually lead to mold and mildew growth. If your bathroom doesn’t have any windows, a bathroom fan is critical for air movement and protects your family from harmful mold-related health problems. With so many options available, what is the best bathroom fan for your ventilation needs? We have reviewed ten of our favorite products for your reference. Guidelines on specific features are provided to help you select the right bathroom fan for your needs. Delta Breez ventilation fans have a super low profile with low energy consumption. This quiet fan operates at only 2.0 sones (a unit of loudness) and features Delta’s reliable DC brushless motor for low noise and long life. The fan includes an LED indicator light so you know when it is running. This Delta BreezSlim fan weighs less than 5 pounds. It’s compact size makes it perfect for a retrofit into an existing space and you can mount it on the ceiling or on the wall. This is a single speed fan with an air flow of 70 CFM (cubic feet per minute). The Delta BreezSlim fan is Energy Star qualified and comes with a 3-year limited warranty. 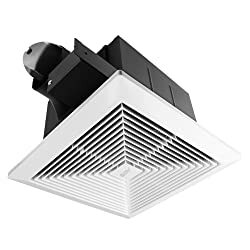 If you are looking for a sleek compact ventilation fan for a small bathroom, this is a great option for your remodel or new construction project. This WhisperCeiling ventilation fan has a built-in Pick-A-Flow speed selector that lets you pick the amount of air flow through the fan. There are three speed options available including the lowest setting at 50 CFM, a medium setting at 80 CFM and the highest speed of 110 CFM. When it is operating, the fan is extremely quiet at less than 0.3 sones. Panasonic has designed this ventilation fan to remove humidity, mold and mildew from your bathroom. It includes SmartFlow technology which increases fan speed when static pressure is present. This feature makes sure that the fan has efficient CFM output. The fan is Energy Star certified and works with both 4-inch and 6-inch ducts. This gives you flexibility in duct layout and design. There is a 6-year warranty on the motor which makes this a great choice for a long-lasting ventilation fan. 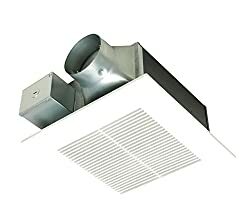 The Panasonic WhisperFitEZ ventilation fan is a great choice for a retrofit or bathroom remodel project. It has a built-in Pick-A-Flow speed selector that allows you to select an air flow speed of 80 CFM or 110 CFM. The low profile 5⅝-inch housing depth allows you to install this fan in 2×6 construction. 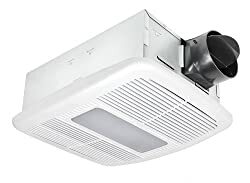 Panasonic designed this fan for 4-inch ducting but it comes with an adapter if you need to connect it to a 3-inch duct. The fan is installed using Panasonic’s Flex-Z fast installation bracket technology. You can use this fan in a shower or tub enclosure as long as it is GFCI (ground-fault circuit interrupter) protected. Operating at less than 1.5 sones, this white Panasonic fan is extremely quiet. It is Energy Star certified and comes with a 3-year warranty on parts. Panasonic’s WhisperWarm ventilation fan comes with an internal heating component. The 1400-watt heating element requires a quick 1-minute warm-up period before it emits heat. The blower wheel on this fan draws air in from both sides of the unit which allows for more effective air flow through the ventilation unit. It is rated for 30,000 continuous run hours. The fan operates at 110 CFM with a noise level of 0.7 sones. This fan requires a minimum of a 20-amp dedicated circuit. The design of this unit allows it to fit in 2×8 construction and is made for ceiling mount only. You should install the heater no more than 8-feet from the floor for optimal heating performance. Panasonic offers a 6-year warranty on the motor and a 3-year warranty on all other parts. This Broan ventilation fan has a white polymeric grill that will complement any bathroom decor. It includes a fan, a heater and a light which can operate independently or together. The integrated light gives you more light source in your bathroom and shows when the fan or heater is operating. The 1300-watt heating element offers fast and even heat distribution throughout your bathroom. The Broan 655 fan requires a 20-amp dedicated circuit to accommodate the energy required for the heating element. The ventilator includes anti-vibration mounts to provide low sound and high performance. This unit has two independent blower wheels powered by separate plug-in motors. The ventilation fan is rated at 70 CFM with 4.0 sones. You should install this fan with a 3-way switch for best fan, heater and light combination performance. This ventilation fan and heater combination unit will cover up to a 65-square foot area. This makes it a great choice for a small bathroom. This Broan 688 ceiling fan is a single speed unit that operates with an air flow of 50 CFM. Broan has designed this fan to function as a traditional ventilation fan for humidity removal and as a continuously running fan to remove air contaminants. 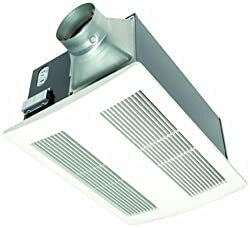 It is an ideal ventilation fan for small bathrooms up to 45-square feet. The white polymeric grill blends in smoothly with any bathroom decor. It includes a torsion spring grill mount which means there are no tools required to remove the cover. You can swap the white grill out with an interchangeable metal grill (not included with this product). This unit can be installed in a shower or tub enclosure as long as it is connected to a GFCI circuit. It has a compact housing unit which allows it to be installed between ceiling joists or wall studs. Operating at 4.0 sones, the Broan 688 ventilation fan may not be the quietest fan on the market, however, it is a budget-friendly choice for any remodel or new construction bathroom project. 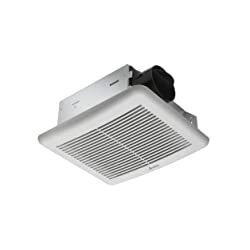 This BreezRadiance series product features a quiet ventilation fan operating at 1.5 sones. It has a single fan air flow speed of 80 CFM and includes a built-in heater. Delta equips the heater module with a thermal cutoff fuse and has a thermostat to provide a consistent heating temperature. Delta’s brushless motor technology allows this fan to run continuously for a minimum of 70,000 hours. It includes a dimmable 13-watt LED light designed to last a minimum of 30,000 hours. This BreezRadiance product is energy efficient at only 7.0 CFM per watt. This is a ceiling mounted unit that has a modern grill design. If you are looking for a quiet combination ventilation fan and heater, consider the Delta BreezRadiance series as a budget-friendly choice. This product offers extremely quiet performance at only 0.8 sones. The flow of the air pulled through the ventilation fan is at a powerful 90 CFM. This unit has a well made exhaust fan with a stainless steel housing and a heavy duty motor for continuous operation. The BV Home fan will ventilate a bathroom space up to 90-square feet. This ventilation fan is a great solution for humidity reduction during showers. The product is Energy Star certified and BV Home offers a one-year limited product warranty. The BreezSlim ventilation fan operates with a noise level of 1.0 sones. It is a single speed fan with an air flow of 50 CFM. There is an indicator light beneath the grill to let you know when the fan is running. The Delta BreezSlim is Energy Star certified giving you the most cost-efficient operation possible. The fan motor is brushless for extended reliability and performance. The galvanized steel construction protects against corrosion after extended use. This ventilation fan has a small installation footprint at only 7.2-inches by 7.2-inches. The BreezSlim is approved for a ceiling mount or wall mount installation. It can be installed easily and is a great option for an existing bathroom remodel project or for a new bathroom project. This Air King ventilation fan has a white polymeric grill that measures 10-inches by 10-inches. It has a durable high-impact plastic housing which adds to the quiet operation of the product. This fan operates at 90 CFM and has a noise level rating of 2.5 sones. This product is a great choice for retrofitting into an existing bathroom. It features a snap-in installation system giving you an easy in-ceiling installation experience. 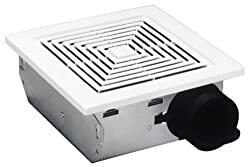 You can install this ventilation fan in a tub or shower enclosure as long as you connect it to a GFCI circuit. The Air King ventilation fan is a budget-friendly choice for a high-efficiency ventilation system. When shopping for a bathroom fan, there are many features you want to consider. You want to get a fan that is the right size and power for your bathroom space. There are other features to consider such as lighting, heating and even motion sensors. Here are guidelines for things to consider before you buy a bathroom fan. Bathroom ventilation fans are measured in cubic feet per minute. This defines the amount of air moved by the fan every minute it is operating. As a general guideline, buy a fan with a minimum CFM rating that matches the square footage of your bathroom. For example, if you have a 100-square foot bathroom, you will want a fan that has at least a 100 CFM rating. Try not to choose a fan that has a lower CFM rating than the square footage of your bathroom. If you do, you risk the fan being too weak to eliminate the humidity and pollutants from the bathroom air. Noise is measured in sones with a range from 0.5 to 6.0 or more. Quieter fans will have a relatively low sones rating such as 0.3. Fans that are louder will have a higher rating. 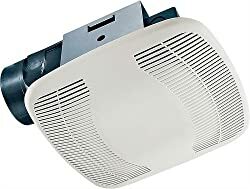 You can reduce the noise level of your fan by installing a larger 6-inch duct attachment instead of the stand 4-inch size. This allows more air to rotate through the duct and should give you a quieter operation. If you do not have enough lighting in your bathroom, consider a fan that has an integrated light. 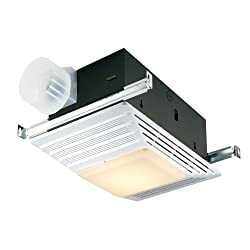 Some fans have enough lighting you can replace an existing ceiling light with a ventilation fan and light combination. Some fans do come with a proprietary or custom lighting module. Be sure you know if the fan light takes a standard bulb or if you must buy a specialty light when it burns out. If you want some added heat in your bathroom on those chilly mornings, consider a ventilation fan that has an integrated heating unit. Fans that include a heating feature often require a dedicated 20-amp circuit. Be sure you have a dedicated circuit before you buy a fan and heater combination unit. If humidity in your bathroom concerns you, consider a fan with a humidity sensor. This type of sensor will activate the exhaust fan when moisture levels reach a specific level. This means you never have to remember to turn on the fan! The guidelines and product reviews above should give you enough details to help you make an informed decision on a bathroom fan. Once you have found a product you like, confirm you have enough electrical power and installation space in your bathroom. We hope you enjoy your new bathroom fan!